WAVERLY, WV--Before you can clearly communicate to the horse what shapes you want him to take at what gait and in what rhythm, you need to have control over your own body. You cannot simultaneously influence the horses shape, gait, and cadence unless you are in the right position over his center of gravity to apply the right sequence of aids with the right degree of pressure and the right timing. To control your body to that extent, you need to have an independent seat. Relaxation is the basic skill riders must master on the way to achieving an independent seat. 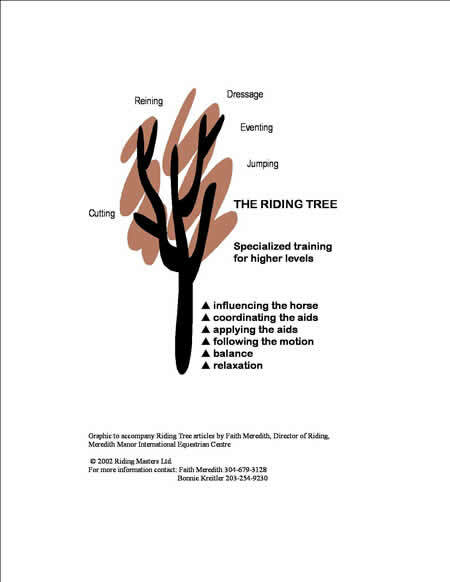 It is the first of six skills that build on one another to create what I refer to in my classes as the riding tree because once students have mastered them, they have the necessary foundation to branch out into any specialized riding discipline they may choose. An independent seat is the strong foundation that allows a student to successfully ride and train a dressage horse or reining horse or higher level horse in any discipline. aware of tension anywhere in their bodies such as their wrists or fingers, their neck or jaw. Scan your body frequently while you are riding for any muscle or joint that is tense. A lot of riders carry tension somewhere in their bodies and it commonly shows up as tension in the lower leg, a stiffening of the seat so that you cant follow the horses motion. So the first thing an instructor should work on is relaxation. If you have stiffness problems, your instructor might have you bounce around without stirrups until your muscles and joints let go of their tension and you can be as loose as a rag doll. Remember, your joints are shock absorbers, especially your hips. Any joint that is braced or tense makes it harder for your body to absorb the shock of the motion of the horse. Obviously, if youre bouncing around on your horses back, his attention is going to be focused on the pain or the discomfort that your stiffness causes him. If anything about your seat makes the horse him uncomfortable in any way, then any other communication you are trying to give is lost. You can empathize with the horse if you imagine that you are riding around and suddenly develop a terrible pain in your calf. Once that happens, nothing else really matters. What your instructor is saying to you doesnt matter because youre dealing with this pain that has to be addressed first. You dont put all the blood, sweat, and tears into developing an independent seat because you want to look pretty sitting on the horse. You put the work into developing that kind of foundation or seat in order to communicate with your horse. Eventually, you need to be relaxed at all gaits on all kinds of horses. As you evaluate your own progress, however, you may find that you can be relaxed at the walk on any horse but you cannot yet be relaxed at the trot on some horses or at the canter on others. What you want is to feel relaxed all the time but in the beginning you are only going to experience it on some horses at some gaits. Mental relaxation goes hand in hand with physical relaxation. If you are not relaxed mentally--if you are nervous about something, if you are afraid of the horse, if you are in pain because of an injury or because you are sickthen relaxation is difficult. When one part of your body really hurts, it is hard to relax another part. If you are really afraid of the horse, even breathing takes some concentration. To relax mentally, you also have to be able to leave behind anything in your life that is causing you stress when you are working with horse. I teach my students that as they are putting their foot in the stirrup, they should mentally picture everything else that is on their mind then picture themselves dumping it over in a corner of the arena. They will leave it there for the hour that they are in their riding class and they can pick it up again when they are through. During the class, however, they are going to relax and focus their attention on the horse. Dumping your problems in a corner of the arena is guaranteed to make your riding better. Every rider has had the experience of a ride that started out badly and ended the same way because they were already in a bad mood the moment they got on the horse. So you have to learn to control that. Who wants to waste their hour of riding because they are mad at someone who just said something nasty to them or because they are allowing whatever else is going on in their life to intrude on their riding time? When you start practicing this visualization, you will find that it not only helps you relax mentally, it also makes your riding a wonderful escape from lifes problems. However, getting on your horse and forgetting about everything else takes practice. Just keep riding.